PUBLISHER: The Writing Works, Division of Morse Press, Inc.
"Tedd Barr tries to teach the readers of his newspaper columns (of which his book is a compilation) the principles of good backgammon. His columns are clear and conscientious discussions of particular concepts, usually illustrated by pairs of diagrams. He shows a position where the concept applies side-by-side with a second position where the concept does nto apply. SlottingWhat Is It and Why Do It? Avoiding a GammonRun or Wait? 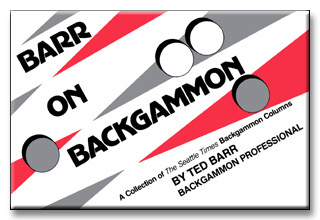 COVER: Barr On Backgammon is a collection of ninety of The Seattle Times best backgammon columns. The book features an introductory section which covers the fundamentals of the game for the non-player or novice. It also includes problems and answers challenging to the intermediate and advanced player on virtually every aspect of the game. The unique problem and answer format enables the reader to examine a particular situation and test himself before reading the author's in depth analysis of the play. The book includes problems and answers in areeas including the positional game, running game, backgame, middle game, bearing off, evaluating your position and the doubling cube. The author also recreates and discusses a number of situations which have appeared in northwest and major international tournaments. These situations include moves made by some of backgammon's greatest players including Paul Magriel, Lee Genud, Barclay Cooke and Oswald Jacoby. Whether your goal is to simply learn to play this fascinating game or become an accomplished money and tournament player, Barr On Backgammon has something for you. QUOTES: "A unique and interesting collection of backgammon columns. Good reading for anyone wishing to improve his game"Paul Magriel, 1978 World Champion, Author of Backgammon. "A wonderful compilation of backgammon problems to challenge and interest the beginner to the most ardent player. "Lee Genud, 1981 World Champion, Author of Lee Genud's Backgammon Book. AUTHOR: Ted Barr is the northwest's leading backgammon professional. After graduating from law school Ted served as Assistant to the President of a major northwest bank. In 1976 he left he corporate field and soon becamse recognized as a leading writer and player of the game of backgammon. His backgammon column appears weekly in The Seattle Times. He also writes a monthly column for Gambling Times Magazine. Ted's firm, Ted Barr and Associates, conducts tournaments and clinics at many of the northwest's finest restaurants and private clubs. Mr. Barr also teaches at La Costa and on the Princess Cruise Ship Love Boat. Ted owns and operates The Game Gallery, one of the largest sophisticated games stores in the country, with locations in Seattle and Bellevue. He also owns Zemby's, a private backgammon club, in Bellevue, Washington. Ted lives in Bellevue with his wife Sharalyn, an officer at Washington Mutual Savings Bank, and their three your old daughter Brittany.